Established in 1924, Faculty of Law, University of Delhi has been one of the tops most institutions producing many Supreme Court Judges and advocates, High Court judges and many renowned legal experts. Delhi University will conduct the DU LLB Entrance Exam 2019 for admissions in its three campuses Campus Law Centre, Law Faculty I and Law Faculty II on 2nd July. No of seats for 2019 academic year remains same as the previous year and that is 2310, thanks to High Court order. This article contains all the useful details required to law aspirants like DU LLB important dates, question paper format and syllabus, DU LLB admission procedure, answer key, expected cut off etc..
DU LLB notification 2019 for admissions is out and you should secure your brochure at the earliest. The application forms are coming out in last week of April 2019. Application for DU LLB is online based only. Applicants have to visit the official website of University of Delhi ( du.ac.in) to fill DU LLB Online Form. They need to register themselves first by using an email id and few basic details. Following are key points while filling DU LLB online form. Account for the online application form will be activated through the link sent to the email address used for the registration. After activating your account, applicants have to fill basic details and upload documents on the site. Scanned Copy of Applicants signature. Class 10th Certificate ( self-attested). Caste, PwD certificate or CW certificate ( if valid, self-attested). Candidates must check the DU LLB Eligibility Criteria before they fill the DU LLB Application form. Graduate or Post Graduate degree from DU or any Indian or Foreign University recognized as equivalent by DU in any course. 50% aggregate marks for General category applicants. 45% aggregate marks for OBC category applicants. 40% aggregate marks for SC/ST category applicants. Further 5% relaxation in the marks for PwD and CW category applicants. DU will release ‘First Admission List’ on 16th July. DU will release notification on the documents required and procedure for the admission. Only after Payment of Fees and Verification of Documents, admission would be considered complete. Applicants selected for the Admission would get the centre according to their rank in the merit list and preference filled in the online application form. From 2019, DU has changed its question paper format, but there has been no change in the syllabus for the DU LLB Entrance Exam. The only difference this time from the previous year exam is that no of questions have been reduced from 175 to 100. Students are advised to read the instructions given in the question paper booklet at the entrance exam for information related to marking pattern. Delhi University law entrance exam is scheduled for July 2, 2019 and the DU LLB admit cards 2019 will be in the public domain by June 4, 2019. Delhi University conducts this DU LLB exam every year to hunt for talent who has a legal aptitude and good grasp of subjects which are covered in the entrance test. 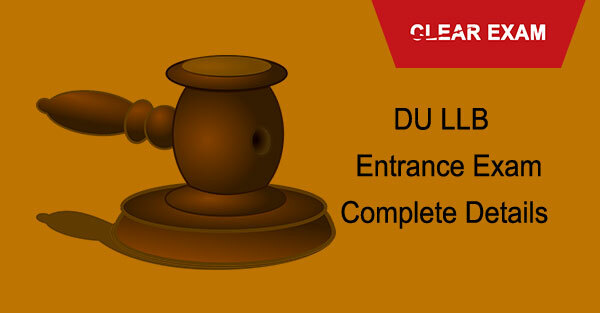 Below mentioned information is all you need to know about securing your DU LLB admit card. Because of the decrease in the no of questions in the entrance exam 2018, cut off is expected to be a little higher in terms of %. Students who are law aspirants must be looking forward to the details of the admission process of the DULLB exam including the part where DU LLB 2019 answer keys are released. A brief introduction to this law entrance exam is that it is the exam which acts as the gateway to three law colleges affiliated to the Delhi University. All these colleges offer 3 year LLB programs.Let us move forward and discuss the answer key announcement in detail. The DU LLB exam will be held on July 2, 2019 and the DU LLB answer keys will be released soon after. After the conduct of the Entrance Exam, DU first, releases individual marks and rank. This will include marks scored by applicants and general and category wise ranks. After few days of this list, DU releases the ‘first admission list’ based on which admission to the three different campused of DU, Campus Law Centre, Law Faculty I and Law Faculty II are done. Since the time CLAT was founded in 2008 the five year law course has more or less replaced the conventional three year LLB but Delhi University has emerged as the sole name which keeps three year LLB courses alive in India. The DU LLB three year law course is a reputed course for all those who are not sure of the career path they will choose post their education and for those who want many career paths open for themselves in the future. So the question we are going to answer is how does one prepare for the DU LLB Entrance Exam 2019. Delhi University will start the DULLB Counselling Process from July 23, 2019. Candidates can check here the counselling process of DULLB which includes the process of three year Undergraduate LLB across the centres of Delhi University. The DU LLB Entrance Exam will be conducted on July 2, 2019 and the DULLB Answer key will be released by the first week of July 2019. The counselling process is considered as one of the most important steps in the complete admission process. The DU.LLB previous year papers are available for free on the website and can be viewed and downloaded by following the link given above. Previous Year Papers are highly recommendable for securing good marks in the upcoming DULLB Entrance Exam. Because many times questions are repeatedly coming in Examination, so it will help the students to score good marks. In a case of applicants has problems related to the Answer key uploaded on the DU, they are required to mail their query to du02@du.ac.in within 48 hours of the release of the Answer Key. If applicants have a doubt over their marks, they can submit a request letter to DU for obtaining the copy of their ORS ( OMR Response Sheet) within 7 days of the release of results by paying rupees 500 in form of Demand Draft. DU will provide the copy of ORS from 16th to 30th day from the submission of the complaint letter. If an applicant finds any error related to his marks, he can submit a complaint to DU.